Bid adieu to the old and welcome the new. Reign in 2016 just like you always do, with a bang. These spicy and sweet chicken skewers will melt in your mouth with flavor, and you'll want to put this peanut sauce on everything! Whisk together lemon juice, agave, soy sauce, ginger, red pepper flakes, and garlic. Pour 1/2 cup marinade into a shallow baking dish, put the remaining 1/4 cup aside. Slice your chicken tenders down the length of the strip to make them into thinner strips. Add your chicken to the 1/2 cup marinade and cover with plastic. Refrigerate for 2 hours. Soak about 26 skewers in water for 20 minutes and preheat a grill or grill pan to medium-high heat. Thread the skewers through the length of the chicken strips and oil your grill grates. Sear or grill your chicken in batches until cooked, about 3 minutes per side. For the Peanut sauce, blend in your peanut butter with coconut milk. add in lime juice, chili, garlic and agave nectar, incorporating well. 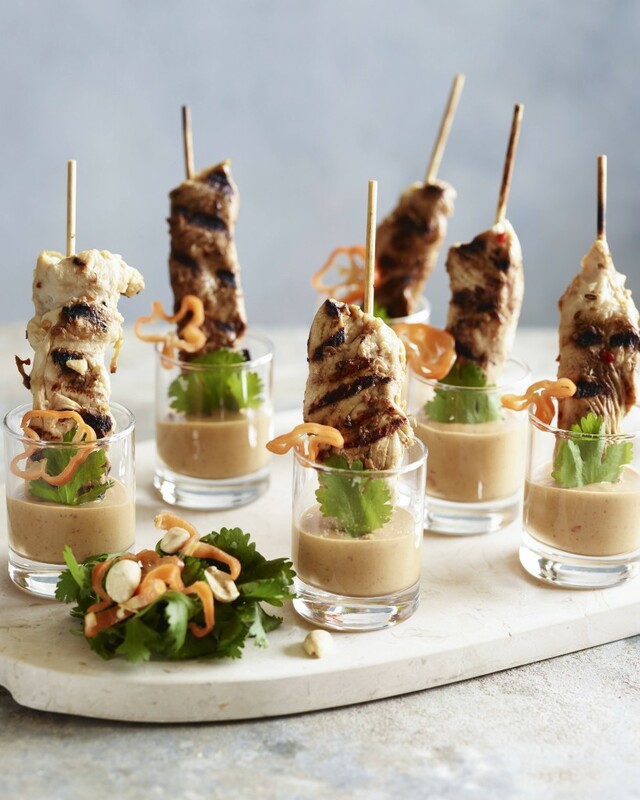 Pour peanut sauce into shot glasses and dip your chicken skewers in. Garnish with cilantro and habanero slices for a party presentation.